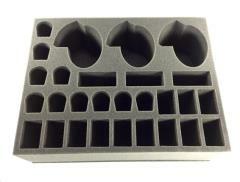 This tray will hold models for the Optimized Stealth Cadre Formation. There is room for twelve Stealth Suits, three Ghostkeels, ten Drones as well as three boxes for storing weapons. 4.5 inch (114 mm) thick tray with 12x 2 x 1 1/4 inch (50 x 32 mm) cut outs and 3x 3 x 1 1/4 inch (76 x 32 mm) cut outs.